Thread: Half-Byte Loader tutorial - run homebrew apps on your unhackable PSP! NOTICE: Mods and/or admins, I would like my original "How to use Emulators on Official Firmware" thread unstickied and have this one take it's place. Instead of just updating the original thread I have decided to let it rest in piece so I can start over fresh. Please delete this notice once you unsticky my old thread. The Half-Byte Loader, commonly referred to as HBL, is a user mode exploit which allows us to run unofficial software, known as homebrew, on our PSPs. It generally does not allow us to run UMD backups known as ISOs but it can run the majority of all homebrew applications. Previously we used Hot Shots Golf UMD to launch HBL on firmware 6.30 and 6.31. Now we have the Sukkiri exploit which works on all firmware versions and is a demo so it's free for everyone. Compatibility will be much higher than that of Hot Shots Golf due to it being a newer game and all. Therefor my tutorials will not explain how to launch HBL using one of the golf games. This tutorial will explain the Sukkiri demo exploit. Format your PSP's memory stick from the PSP before you do any of this. Formatting your memory stick will erase all of your data so make sure you have important stuff backed up. 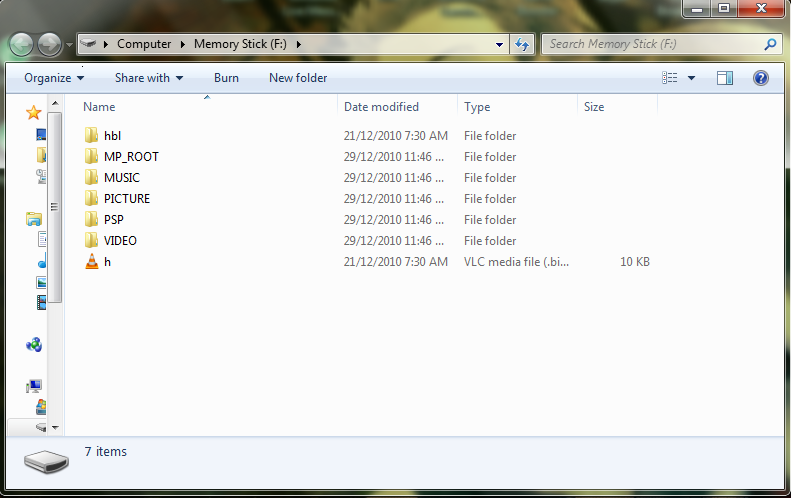 Don't put anything on the memory stick until I say so. Connect your PSP to your computer via USB or by using a card reader. Open the hbl-r112-sukkiri-wololo.zip file on your computer extract the contents of it to the root of your memory stick. 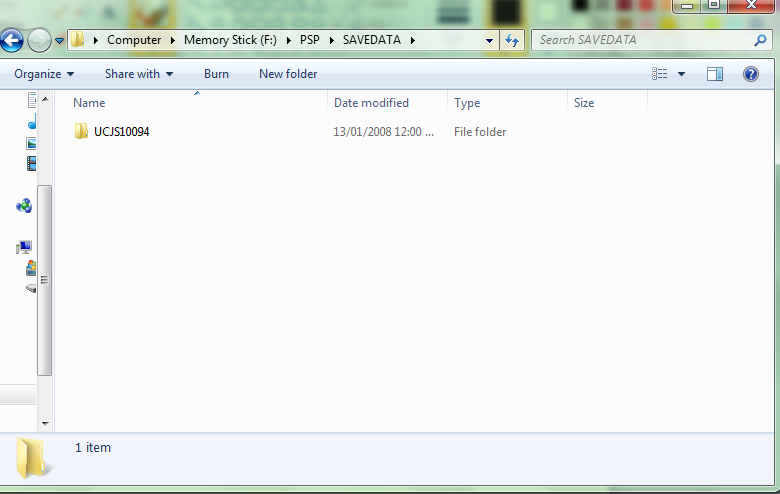 Open the game save archive (UCJS10094.zip) on your computer and extract the contents of it to your memory stick. The UCJS10094 needs to go in \PSP\SAVEDATA\. Then you need to open the everybodys_sukkiri archive on your computer. You should see a folder named NPJG90047. 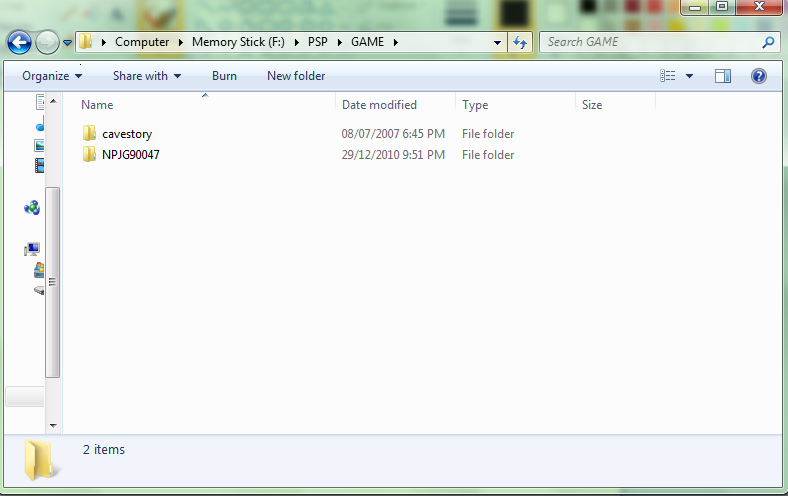 Copy that folder to ms0:\PSP\GAME\. You will also need some homebrew to test out. Here is a list of 15 essential homebrew apps that are working on HBL. You may have more folders and files but those are files required for this exploit. You need to safely disconnect your PSP from your computer. Go to GAME on the memory stick and launch the Sukkiri demo. You will see some black screens with Japanese writing. I assume these are copyright statements, credits, or health warnings. Just wait for them to pass. You should come to a screen with two options. You want the bottom option. Press O to select it. HBL should launch, select a homebrew and have fun! Last edited by Organized_Chaos; 12-30-2010 at 11:10 PM. I read everything and tried my best to follow the instructions given step by step, but it seems every time I try to load the demo, which loads perfectly, crashes? Or just returns me to the menu when prompted to press "O". I formatted my memory stick and double checked everything. My PSP model is 1000. My firmware is 6.31, if that helps. Last edited by Razorshades; 12-30-2010 at 01:23 AM. Does your memory stick look something like this: ? Excuse me being a noob at all this stuff, but what do you mean by "ms0:/"? As for the items, do screenshots help? I think I got most of them. 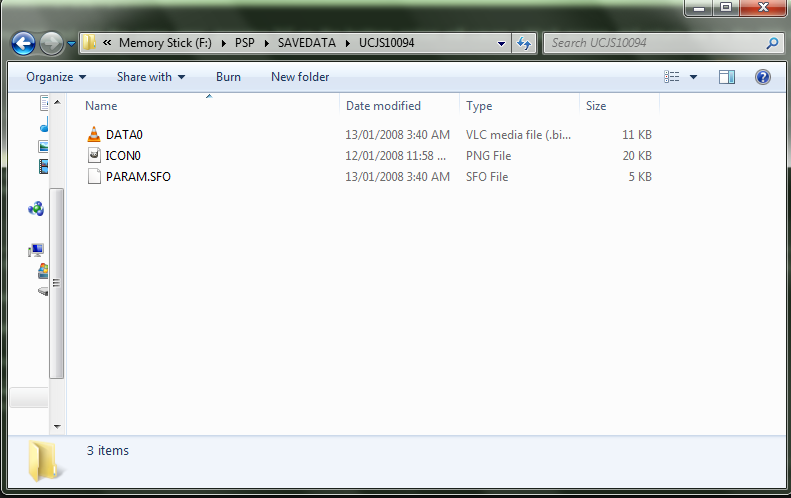 PSP/SAVE DATA shown with the UCJS10094 folder. 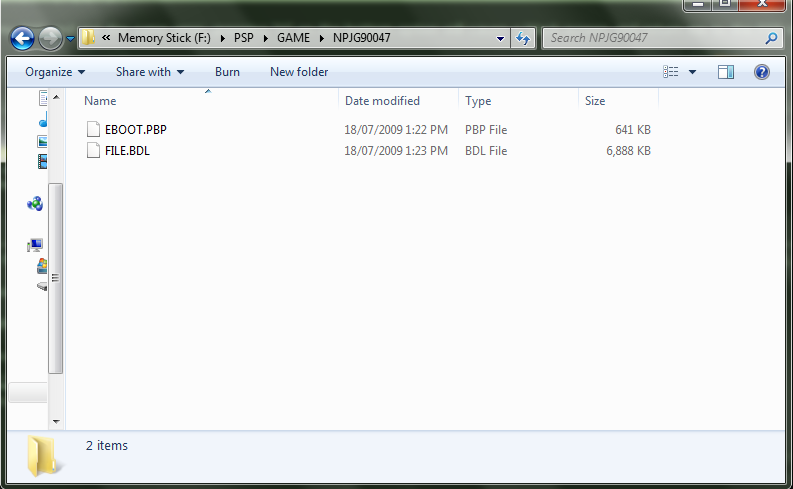 HBL folder inside the ROOT of the PSP. Again, I formatted my PSP and got the same error, pressing "O" on the bottom option will cause a black screen and return me to the PSP menu. 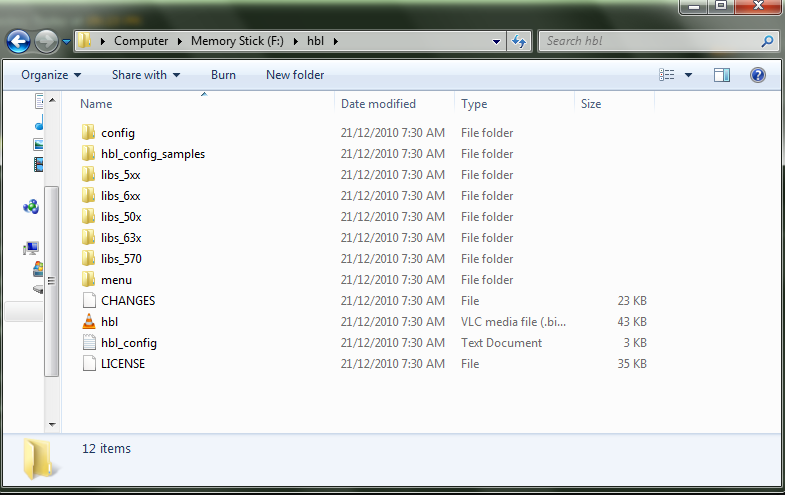 ms0 just means it's the first memory stick. If the PSP had space for two or more memory sticks then you would be able to have ms0, ms1, ms2, etc. ms0:/PSP/GAME would be F:\PSP\GAME on your computer. Can I see a screenshot of the inside of the NPJG90047 folder? And inside the savedata UCJS10094 folder? The screenshots you showed look fine to me. I think the problem may be with the save data. I don't know how to help you. You have done everything correctly. The only other option I can think of is to download and install the development build from this page: http://wololo.net/wagic/half-byte-lo...p-to-ofw-6-35/ and then post in the forums at wololo.net/talk where they will ask you for the logfile it creates. You're the first person I know who has tried this on a PSP-1000... maybe it just hasn't been tested a lot yet. I actually gave up last night since it was so late, but yeah. The save I used from that site actually made the HBL work, might want to add that to your guide for future reference.